You are here: Home › When Anxiety Limits Your Life, How Can You Start Liberating Yourself? Social media is teeming with clever posts about not wanting to socialize—or even leave the house! Some of these are quite funny and can feel validating for those who are not of the extrovert variety. Many of them, however, are dangerously inaccurate. Generalized anxiety and/or social anxiety are not the stuff of comedy. They are not topics to be properly addressed in flippant social media posts. We all get stressed out at times. And we all feel anxious. What we call “anxiety,” however, may be an anxiety-related disorder. Of course, many other diagnosable conditions regularly exhibit anxiety as a dominant symptom. The primary point here is that anxiety is common and nothing to be ashamed of. However, at the same time, it can lead to thoughts and behaviors that limit your life and cause distress. You’re not good enough, smart enough, pretty enough, fit enough, rich enough, etc. No one likes you. It’s easier to just not try. 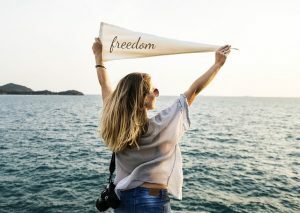 These examples are just the tip of the iceberg—all leading up to you living life according to the irrational ideas of your negative internal monologue. Disturbances in the way you eat and sleep can have a dramatic impact on how you live. They not only impact your energy levels but your mental well-being, too. Thanks to the lies it tells you, anxiety often leads you to choose isolation as your default setting. But distancing yourself from your loved ones only creates more problems. You live in regret of the past and in fear of the future. But where does the present fit into that equation? Your worries, in fact, remove you from living in the present moment. Anxiety can keep you in a state of panic and fear. You feel unable to do anything except seeking ways to find relief. Hence, future plans are put on the back burner. As stated above, anxiety is common. It’s not a unique flaw of yours. Accepting this allows you to focus on learning more about the condition… and the many ways to recover. Isolation may, at first, seem logical. In reality, though, you need lots of social support. Connect with those who are important to you. Let them know how you feel. Each of us experiences anxiety in a specific way. Regular journaling can reveal the patterns and the triggers. Such awareness will help you navigate the episodes. In the moment, anxiety loses much of its power. Learning to stay present is like kryptonite to anxiety. That’s why developing mindfulness skills will keep you grounded in the here and now. Anxiety develops over time. Recovery from anxiety is a process that requires patience and commitment. Staying the moment, as just mentioned, and making each step count is a powerful way to seek recovery. How Can You Start Liberating Yourself? A giant step toward liberation is asking for help. You’ve gotten past the misinformation and educated yourself. From there, you have accepted the presence of anxiety and the negative role it plays in your life. You’ve even taken some powerful self-help steps. But there’s more to do, and it begins with finding a professional to guide you. Therapy is a proven path for those seeking liberation when anxiety limits your life. Take that first step and discover the possibilities.